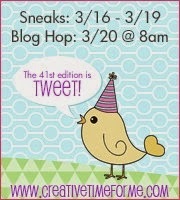 Liz's Paper Loft: MCT March Release Sneak Peek Day 3 ~ wishing you! Today I have a brand new stamp set and sort of a new die, Love You Bunches stamp and die sets and Jr. Rolled Flower Dies. Now the new Jr. Rolled Flower Dies are two flower dies. And yes it's just what you're thinking...they are "baby flowers" like the flower die we already have! So now you'll have small, medium, and large flowers for all your crafty needs! 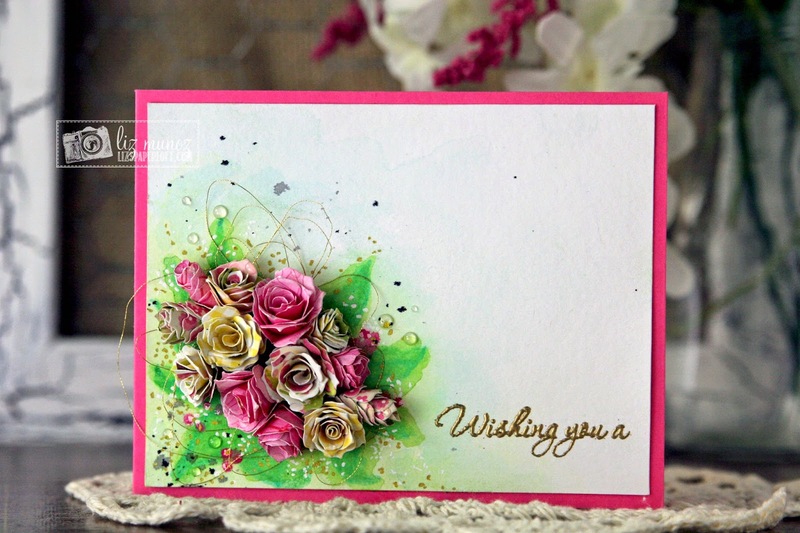 To create this card, I first watercolored with greens, yellows, and pale blue the background. While waiting for it to dry I die cut the flowers and rolled them. Of course I used both of the new sizes. I love how no two are the same! After adding gold thread, I adhered the flowers to create the bouquet. Once all the flowers were dry, I heat embossed the part of the sentiment, and the rest of the sentiment on the inside of the card. Oh my I just realized I didn't take a picture of the inside :/ well it says "Happy Mother's Day". The sentiment is from the Love You Bunches stamp and die set. After it was all put together, I felt it was still lacking something. So I carefully added the splatters of black and gold. Lastly I added some drops of glossy accents to the background and the petals. Oh my goodness! I'm speechless! Your card is absolutely stunning! I LOVE all the flowers and the colors too! I also love way you did the flower in the first picture, very creative idea! Awesome card!! OMG Miss Liz your card is absolutely Gorgeous you totally did an outstanding creative job WOW your flowers are so beautiful and you did it again a beautiful Shabby Chic work of art.....I'm in awe of your creativity WOW your card is Fabulous. YOU so ROCK! Wow! This is an amazing card! I love everything about it. 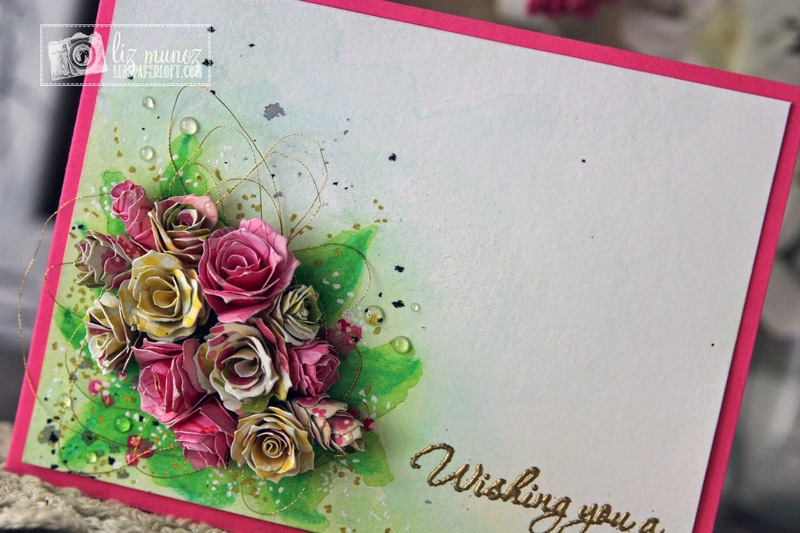 Just love the roses on this card!!!! Liz can I just say I love your work. Every time I pop on over I'm blown away. Your truly talented! This card is beyond stunning. I love the water color leaves and the pattern paper for the flowers is perfect. (my fav colors) and the splatters of paper and gold thread ugh perfect!! Awesome job!! Just beautiful, no doubt about it. The roses I'm sure took a lot of time but are Well worth it! Lovely!!! This is just AMAZING Liz!! WOWZERS I LOVE your card!!!!! So beautiful !!! I just love how everything is incorporated together. LOVE LOVE LOVE. Oh wow! Your card is beautiful!!! Those flowers are stunning!!! I cant believe I havent been using that larger rolled flower die!!! Liz ~ All I can say is your card is simply breathtaking GORGEOUS!! I call DIBS!! WOW!! BEAUTIFULLY done! Gorgeous card! The water coloring and spatters is a beautiful touch. This is beautiful. I love the large cluster of flowers, framed by the green for the leaves. I would be thrilled to get this card. Liz, your card is absolutely gorgeous. WOW, I love how you did the background and how you added the rolled flowers. Stunning. Such a great card. Beautiful work. Beautiful flowers and I like the addition of the gold thread. Thanks for sharing your beaytiful card. Your 3D flowers are beautiful. Seeing all of these beautiful mothers day cards makes me miss my mom. 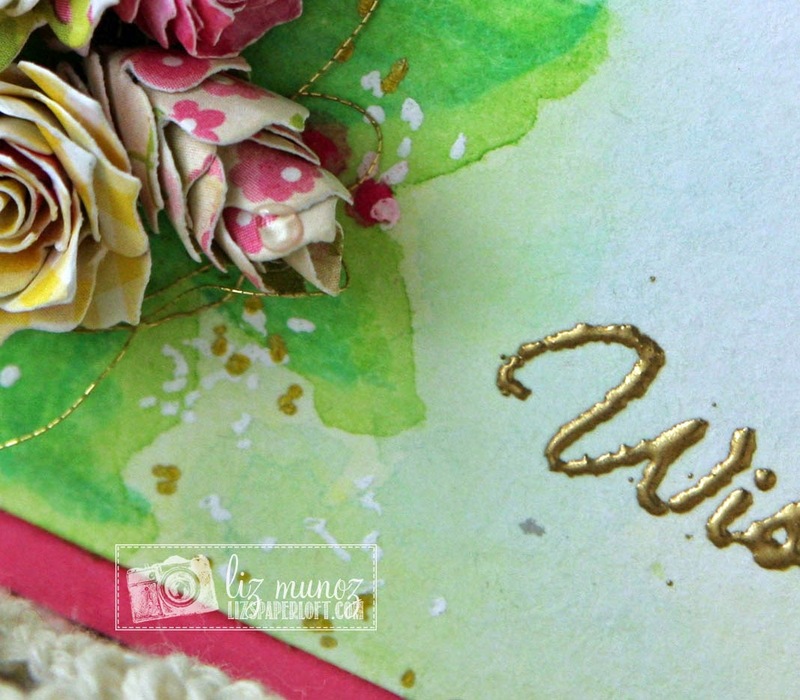 I love the way you positioned the flowers over the gold thread and the watercoloring. Such a stunning card! I love your flower bouquet. These dies would be great to have. Lovely card with beautiful rolled flowers! Love the dimension they add! WOW What a beautiful card!! I love those awesome flowers!!! Have a great day. WOW! beautiful! Love the background and all the flowers, and the gold thread is just a great addition. Wow, that is so beautiful. Love the flowers. This is so unbelievably GORGEOUS!!!! I don't have words to describe how beautiful is your card!!! is stunning!!! A little bouquet for that special someone. I love the background that gives the bouquet dimension and interest! The water color and spatters are wonderful. I really like the thread and Glossy Accents. Beautiful background for the pretty new rolled flowers. Fabulous job. Your card is gorgeous! Love all the flowers and colors. You did an awesome job. Oh my gosh Liz! Your card is STUNNING! I love the watercolor behind the flowers....it's so BEAUTIFUL! Thank you for sharing :) Have a wonderful day! Wow!!!! Liz I love this card and the watercoloring behind the rolled flowers is awesome TFS girl!!! Wow!!! This card is stunning, Liz! I just love what you did behind the flowers! Must have been a little messy (haha), but so worth it for the effect! Stunning, that grouping of roses with the watercolor background is beautifully done! !